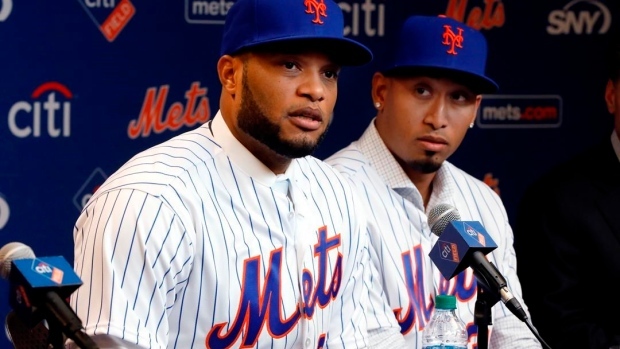 PORT ST. LUCIE, Fla. — New York Mets infielder Robinson Cano had a youthful perspective after reporting to spring training. "I feel like I'm 25," the 36-year-old All-Star second baseman said Sunday, a day ahead of the team's first full-squad workout. Cano took a physical and held a news conference. He took over the spot in the clubhouse that used to belong to Mets captain David Wright, who retired because of neck and back injuries. "First of all, nobody's going to replace David Wright," Cano said. "David Wright is the organization. We all know what he did through the years. I feel special that I get to have his locker. This is a game that you play as a team. I'm going to go out and do my best and give it everything I've got, yes I will. But I don't like to pressure myself and go out and be that guy." Cano was acquired Dec. 3 from Seattle along with All-Star closer Edwin Diaz, the first big move made by new general manager Brodie Van Wagenen — Cano's former agent. "He said he was going to go out and build a team that could go out and compete. He has a lot of good pieces, and this team looks really good," Cano said. Cano hit .303 with 10 home runs and an .845 OPS last season, though he was banned for 80 games for violating baseball's drug agreement. Cano tested positive for Furosemide, a diuretic that can be used to mask performance-enhancing drugs. The eight-time All-Star is expected to be the regular second baseman, causing the Mets to shift 26-year-old Jeff McNeil to a utility role that could include time in left field. McNeil hit.329 in 63 games for the Mets last season. Cano has played 14 games at first base during his 14-year big league career. "I haven't thought about that yet," Cano said of possible time at first. Having spent nine years in New York with the Yankees, Cano had some advice for the 24-year-old Diaz about playing in the Big Apple and tuning out media and talk-radio. "He's a young kid. It's different, especially when you come through the system with Seattle — you don't deal with a lot of media," Cano said. "I told him just to go out and don't let the big city get into your head. Go out, compete, and have fun . knowing you're human and not perfect. It's the same game in a different city. Don't focus on the city." Cano left the Yankees after the 2013 to sign a $240 million, 10-year contract with the Mariners that pays $24 million annually. As part of the trade, Seattle sent the Mets $5 million on Dec. 21 and will send New York $3.75 million on Dec. 1 in each of the next four years. Cano wondered about the current free-agent market. "It's hard when you, as a player, go out and put out the effort in the off-season and put up numbers, and you're just waiting to be able to get a deal. You deserve a deal, you put up the numbers, you're young and you have the talent and not able to get a deal. Baseball is going to a different direction right now because there are a lot of guys out there who don't have a job." Top players such as Bryce Harper and Manny Machado have not reached agreements. "I'm surprised. I would say every baseball player is in shock," Cano said. "Machado and Harper are young guys who've been in this league and put up numbers. Machado played in the World Series last year, Harper won an MVP before. I thought by this time they would already be signed."